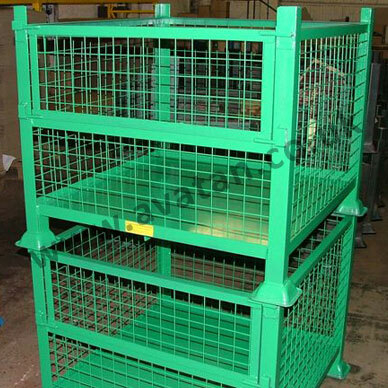 Euro style collapsible steel cage pallets interstackable with standard Euro Gitterbox. Stillage having mesh sides and corrugated sheet steel base. 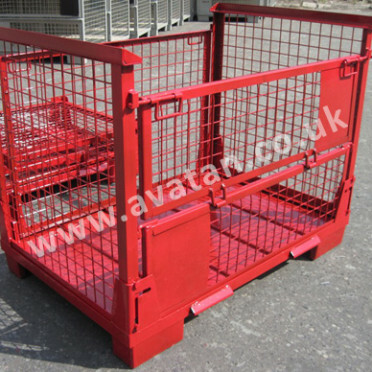 With all four sides hinged to the base, this half drop gated cage pallet folds flat for empty storage and transportation. 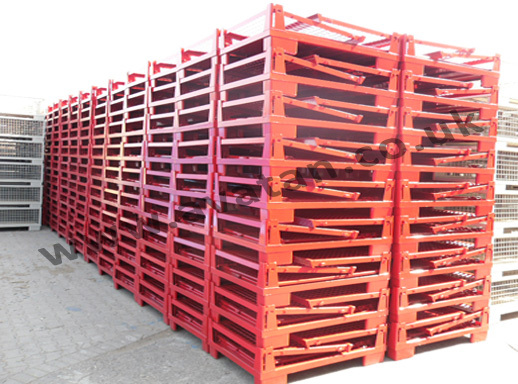 Suitable for 900kg uniformly distributed load per pallet stackable four units high. 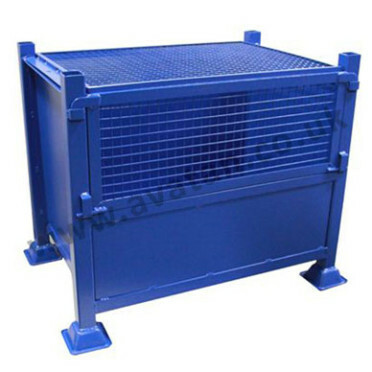 This style of unit may also be manufactured as a box pallet with solid sheet steel sides. 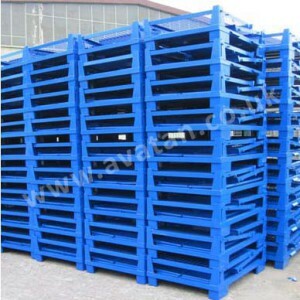 A variety of heights are also available for these collapsible pallet cages. 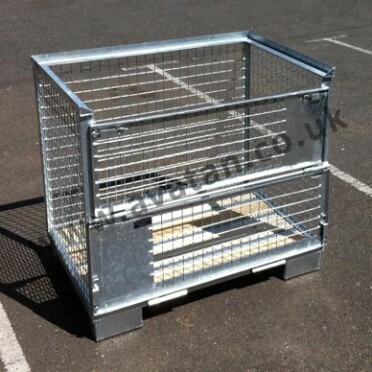 Alternatively, other sizes of KD Collapsible cage pallets and box pallets may be manufactured to order. Available in standard and special sizes manufactured to suit individual customer needs. 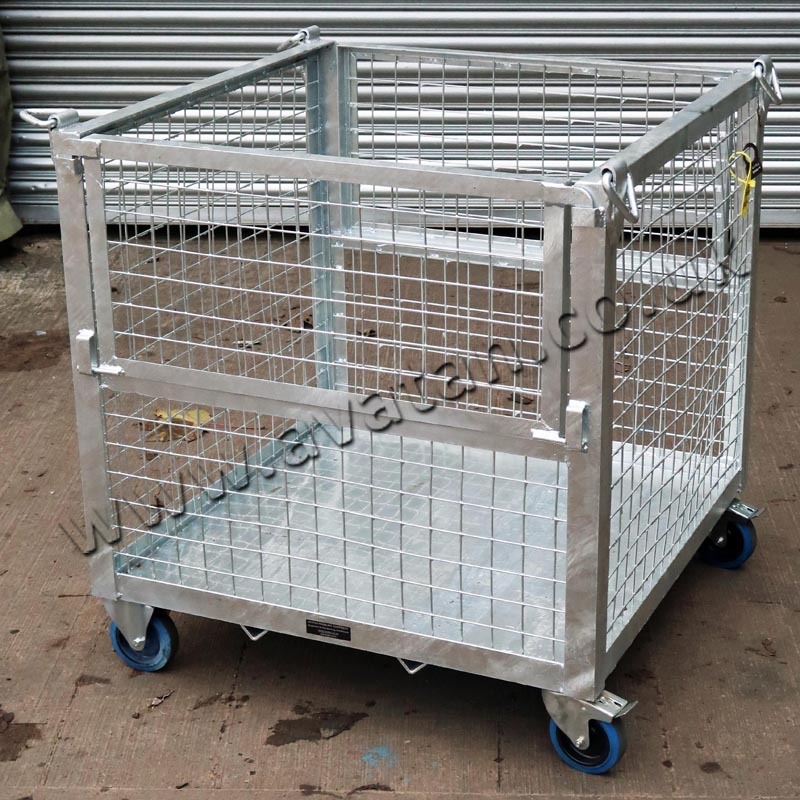 May be fabricated with removable or hinging sides and can be fitted with a half drop or fully removable gates.Standard construction suitable for 500kg or 1000kg uniformly distributed load stackable four units high. Finished in blue, red, green, yellow or grey air dry enamel paint. This unit as pictured will interstack with SHC90 Euro cage pallets and Euro Gitterboxes. Available rigid or demountable. Generally held as a stock item for immediate despatch. We can adapt the item illustrated to suit your own specific needs, please ask for further details.